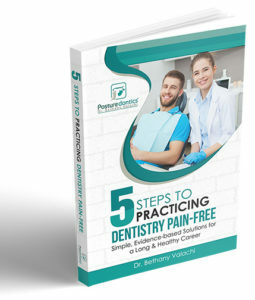 Some of the biggest dental manufacturers make non-ergonomic products that can actually create pain syndromes. Recognized internationally as an expert in dental ergonomics, Dr. Bethany Valachi is Instructor of Ergonomics at OHSU School of Dentistry and has performed unbiased, evidence-based evaluations of hundreds of dental products over the past 20 years. Take advantage of Dr. Valachi’s wealth of knowledge. Watch a video to find specific stools or loupes that FIT YOU! NOTE: Dr. Valachi does NOT have any financial affiliation with, or receive any commission from manufacturers. We do not sell dental equipment. 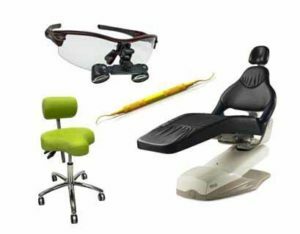 Find ergonomic equipment that benefits your health! Operator stools run the gamut from non-tilting, no backrest, saddle stools and no armrests. Which styles are truly ergonomic? There is only 1 style of loupe on the market that Dr. Valachi has found consistently keeps dental operators in a safe head posture. Properly supporting the cervical curve is key to improving patient's tolerance to being reclined, which improves YOUR posture! Lighting should parallel the operator's line of sight as closely as possible--but which styles has the least harmful blue light? Patient chairs must allow easy access to the oral cavity to allow the operator to maintain optimal posture.